We are delighted to announce that The Theatre Make A Difference Trust has given us a substantial donation, which allows us to start work on our Clinic, which will be an integral part of our Community Centre building project. We do thank them for their support. Annette Mbedha’s hosting of the first Educational Training Conference was very successful. Supported by the Barrington Education Initiative (BEI), who funded the attendance of Specialist Coach Simona Sabbatini & Professor Reeta Snawt to officiate. 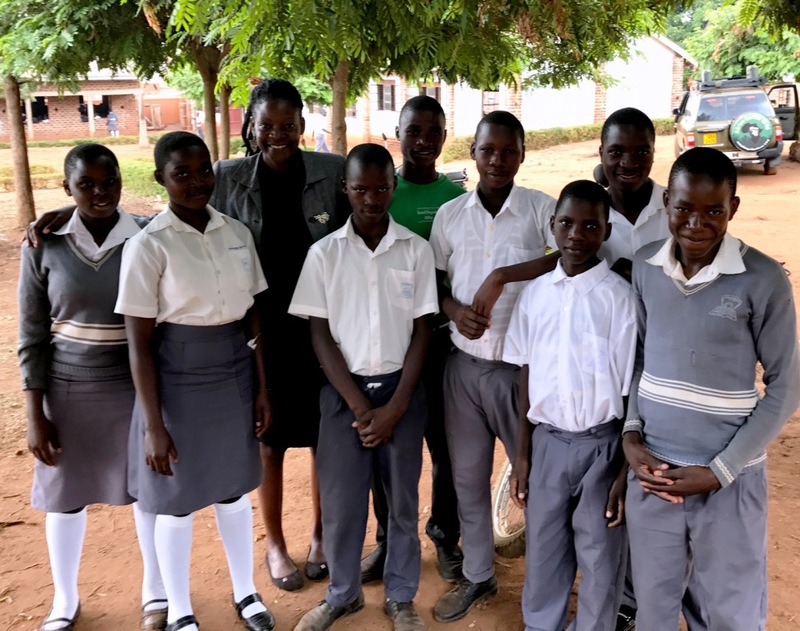 When they all attended Butansi Nursery School on one of the day, they were highly impressed, saying that they had never seen such a professional set up in a rural area. BSUF Founder Annette Mbedha is organising a Nursery Teachers Training Conference, which is being funded by the Barrington Education Initiative. 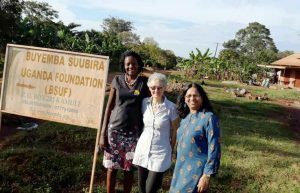 BEI has already funded the building of a purpose built Nursery School in Butansi and a Teachers Association in the village. However, the 5-day conference is being held in Kamuli Town, not Butansi because of the current lack of reliable electricity in the village. Another reason for us to build our Community Centre in Butansi, which will then be able to host such events. 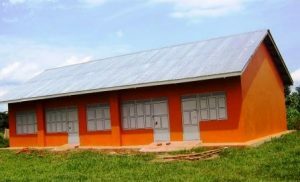 Over 30 teachers from different rural nurseries will benefit from the training, as well as some nursery teachers from some private and government schools in Kamuli town. Annette is hoping for between 50 – 60 attendees, who will greatly benefit from the conference. Again we thank BEI for making this possible. We are delighted to announce that one of our brightest students, Jonathan Oketayot, has been elected as Vice President of Dar es Salaam University’s Law Society. The Inaugeration Ceremony took place on the 22nd June 2018. 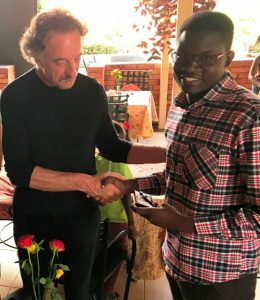 Jonathan has also been elected on a seven team delegation (3 students and 4 lecturers) to represent Dar es Salaam University at the UN Chapter Forum in Nairobi, during the first week of July. They will discuss & debate Conflict Resolutions in East African States. 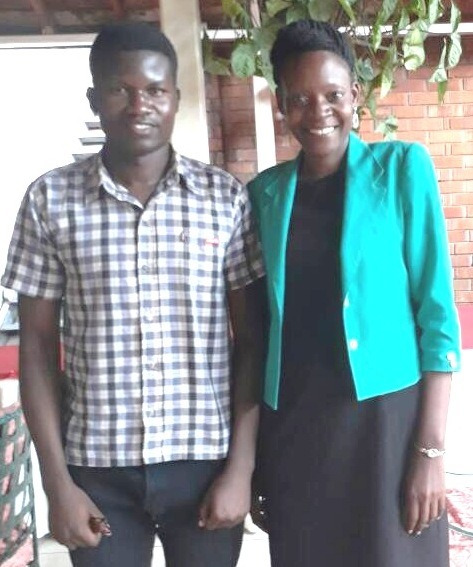 Well done Jonathan, we are so proud of you and a big thank you to the Signum Foundation who provided a special scholarship for Jonathan’s education. As well as the new kiddies at primary level we have taken on three bright boys that would miss out on a good education if we did not pay for their studies. Cosmas has written to Annette and Jon to say how appreciative he is. He found it difficult to concentrate on his studies, worrying about whether his mother could afford his school fees & exam costs. He is so much happier now and determined to succeed. All three now have a brighter future. Now we will have plenty of space on which to build our health clinic, Skills Development & Arts & Culture centres, as well as a Community Hall & Youth Centre and catering & accommodation blocks. 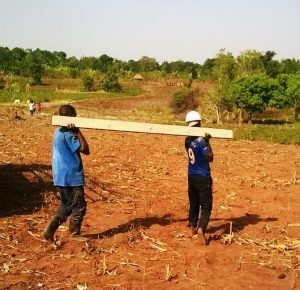 The surrounding land will be cultivated to allow the centre to be self sufficient as well as to teach villagers on good agricultural practices. 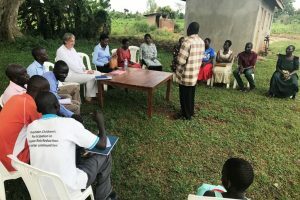 Trustee Jon Exton, on a recent visit to Uganda, meets with the Butansi Community Leaders about the Community Centre project. We are still seeking donations for this important project. 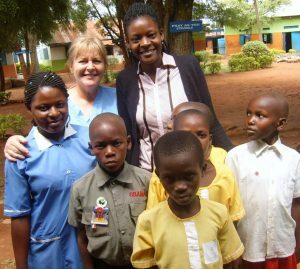 On the Trustees last visit in February, Annette recruited 20 new young children into our education scheme. 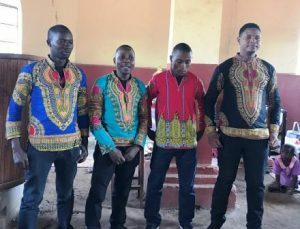 They will be attending Grace of God Primary School in Butansi. Please get in touch if you, or someone you know, would like to give an education to an underprivileged child in Uganda. Peter Mugogo has been appointed as a New Trustee of BSUF. 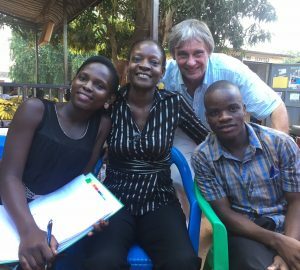 Peter is involved with other charities in Uganda – and his skills as a project manager, as well as driver are proving invaluable. We know he will make a great contribution to our work in Uganda. Annette took John & Jon to some of the secondary schools in the Kamuli area where we have placed our sponsored students. 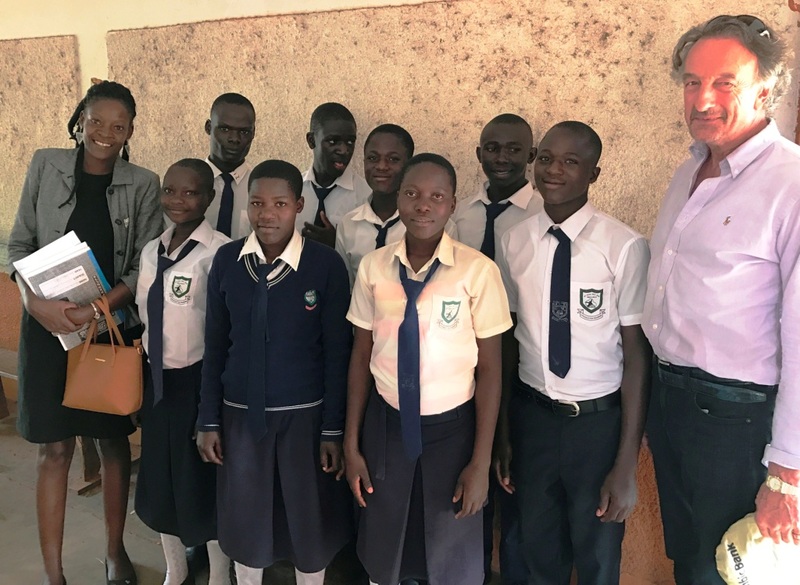 Here are photos of John & Annette with our students at St Paul’s Secondary School, with Sharon at Bethany School and our students at Kamuli Progressive Secondary School. Our three university students, Jonathan, Sharifa and James, were delighted to receive specially engraved pens brought over from England. 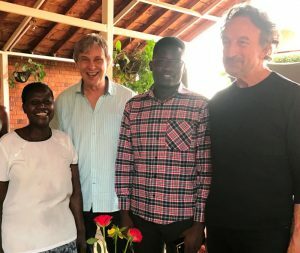 John and John enjoyed meeting up with them all again in Kampala. John Faith presents a pen to Jonathan and Annette presents pens to Sharifa & James. 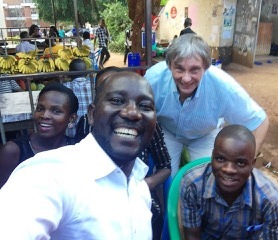 The last photo shows our Trustees with all three students and also Jonathan’s mother. 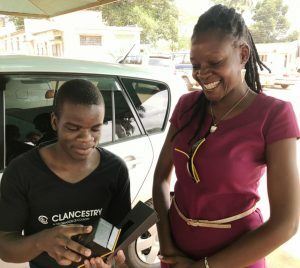 She is so proud of her son’s achievements and so grateful to the Signum Foundation for their ongoing support. 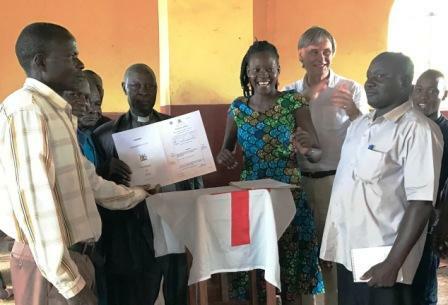 Chairman John Faith & Trustee Jon Exton, along with BSUF Founder, Annette Mbedha, attend this service for the handover of the Land Titles between the BSUF Board, the church & the Busoga Diocese, represented by the Kamuli Archdeacon. Then everyone went out to the site of our Community Centre, for the ‘Ground Breaking’ ceremony, officiated by the Archdeacon and the BSUF Board. We invited the Kawa Quartet – a talented group of gospel singers – to come from Kampala especially for the ceremony. Kawa were the highlight, with their wonderful singing that filled the church and enthralled the audience – who whooped with delight. 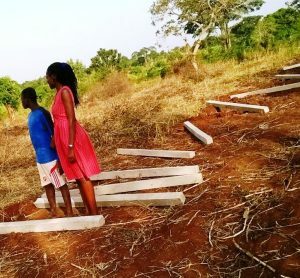 BSUF Founder, Annette Mbedha has been in Butansi overseeing the clearing of the site for our Clinic & Commuunity Centre Building project. A secure fence has been put in place… so that we will soon be ready to start building. Children of Uganda UK supports a number of Women’s Self Help Groups in the local area. 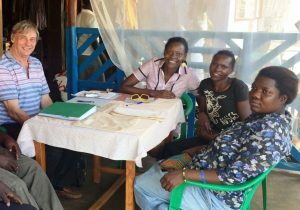 Jon attended one of the first groups, where they were meeting to give out another loan to one of the members. 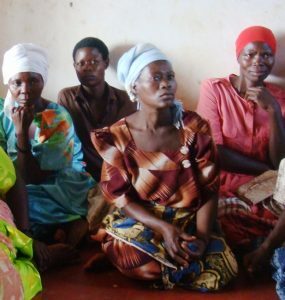 It is a nervous time for the women, waiting to know if they have been successful this time. They 3rd photo shows the grateful recipient. And the next photo shows Jon Exton being given a live chicken to thank him for his support. The last photo shows Jon and Annette meeting with two local deaf women, who have started up a knitwear business. One of their machines had broken so we gave them money for repairs and have also agreed a loan to help the women to grow their small business. 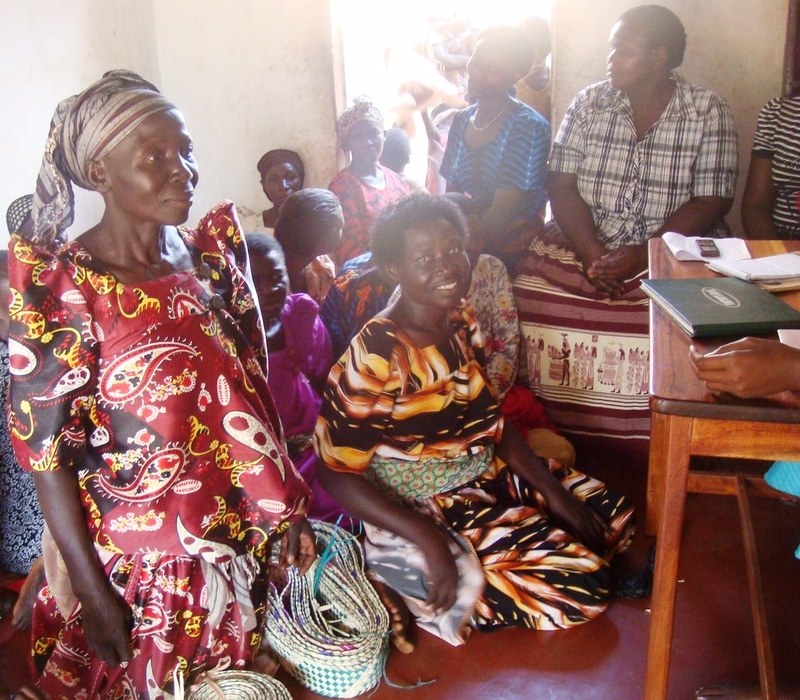 This programme is helping the women to earn a better living to support their families. 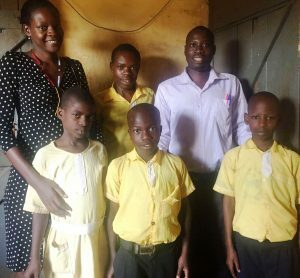 Grace of God School is where we sponsor our primary school children. 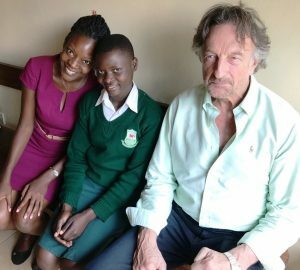 They spent some time with Robert, the headmaster and the children. 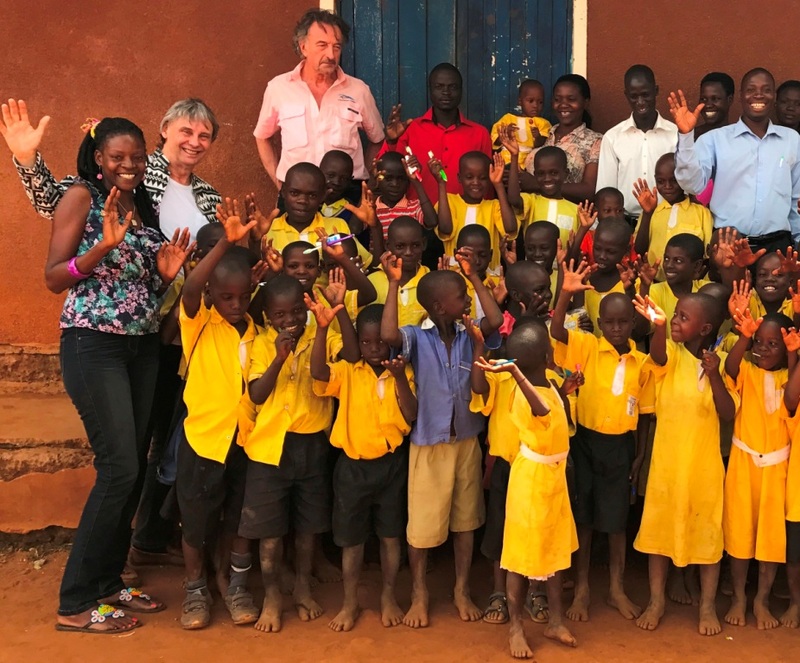 In the first picture you can see Annette and Robert with some of our BSUF children. The last photo features Duncan Cramb doing a ‘selfie’. He was in Kamuli at the same time. 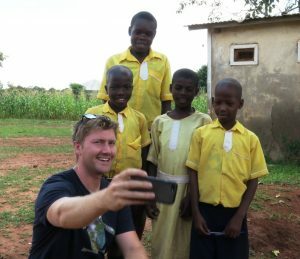 This was his second visit… last time he did a sponsored bicycle ride in Uganda and he has continued to support our charity. Jon Exton and Annette visit Kyambogo University in Kampala, to meet with two of our highest achieving students. We have sponsored Namuddu Sharifa and Kimera Wakabi James through primary and secondary schooling in the rural area in SE Uganda, where our charity is based. Through your support, they are where they are now. 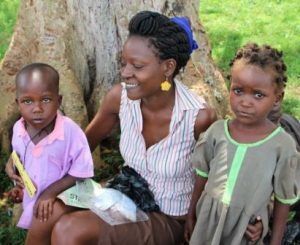 This is so rewarding for our charity and Founder Annette Mbedha… and how we are trying to make a difference. We are continuing to support Sharifa and Kim with their studies. While in Kampala they also met with the mother of Oketayot Jonathan, who has just started a degree in Law at Dar es Salaam University in Tanzania. A single Mum, she is overwhelmed by her son’s success thanks to the support of the Signum Foundation in Poland, who have supported Jonathan since the end of primary school. 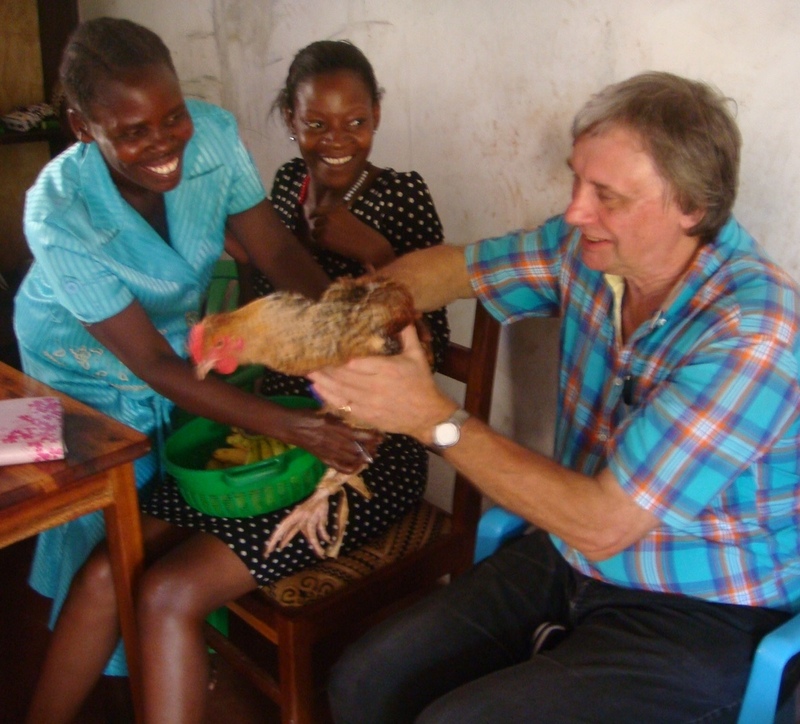 Jon Exton has been visiting Annette Mbedha and BSUF in Uganda. After a couple of days in Kampala, they travelled to Kamalu, near the rural area of Butansi – where BSUF operates its Educational Programme and other welfare projects. Dentaid were running a number of dental clinics at Maria’s Care in Kamuli and Annette was given the opportunity to put a group together of children and villagers in need of dental treatment. 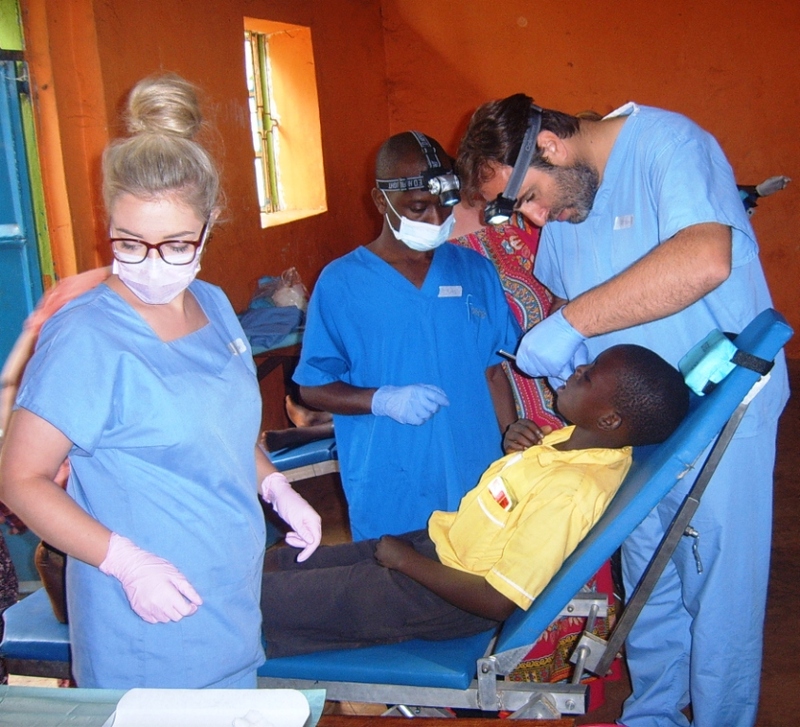 It became clear that the children should be taught better oral hygiene. 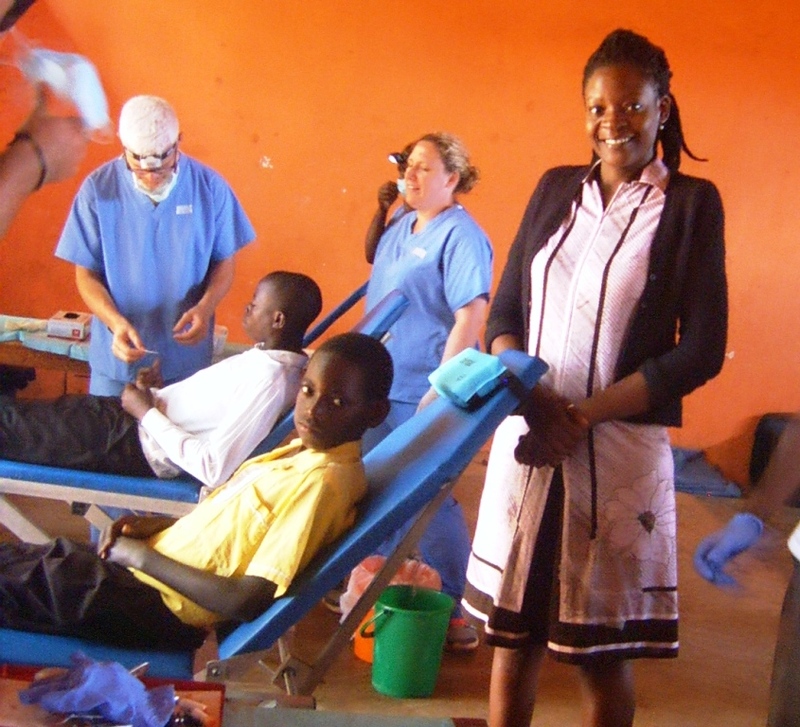 Annette was pleased to make some contacts in the local dental area and is hoping to organise another clinic in Butansi in the near future. Kimera Wakabi and Namuddu Sharifa, long term students in our Sponsored Educational Programme have just begun degree courses at Kyambogo University in Kampala. 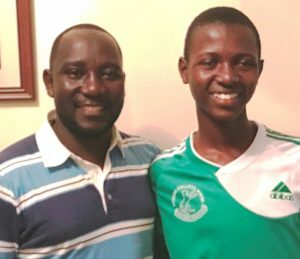 Orphan Kim Wakabi, who first joined our Programme at primary school level, is doing a BSc in Technical Engineering. 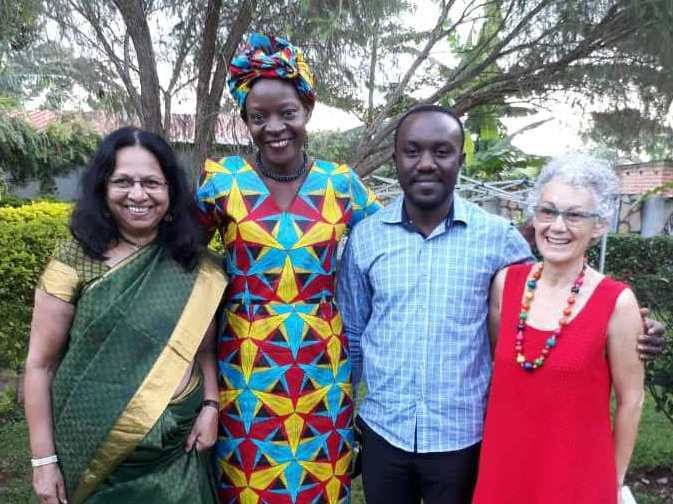 Namuddu Sharifa is doing a degree in Management Science. 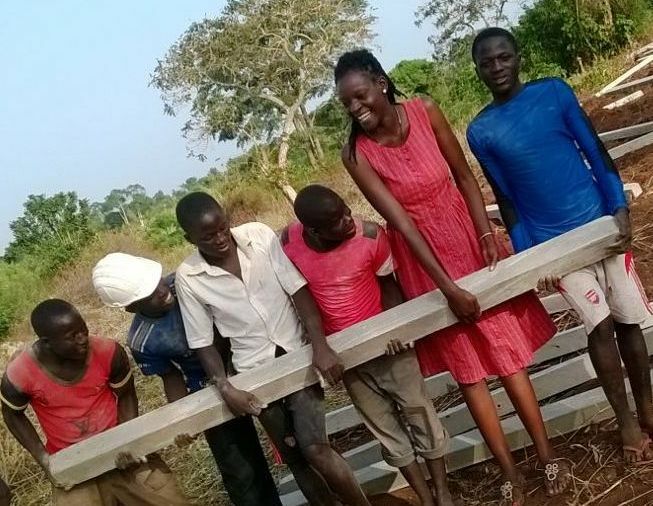 This is a great achievement for two teenagers from a rural district in Uganda and makes our programme so worthwhile. However we need more funds to support their ongoing higher education and accommodation fees. Annette recently noticed that some of the kiddies at the new Butansi Nursery School did not seem well. 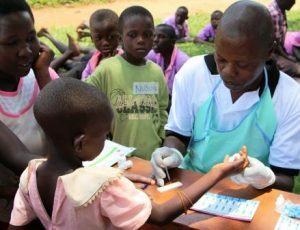 So she arranged for a medical team to visit the school for the day, to test and immunise the children. Many were sick with malaria, mumps or a fungal infection. They were treated on the spot with the right medicines. BSUF is hoping to roll this mobile medical clinic out to other schools in the area to keep a regular check on the health of the children. 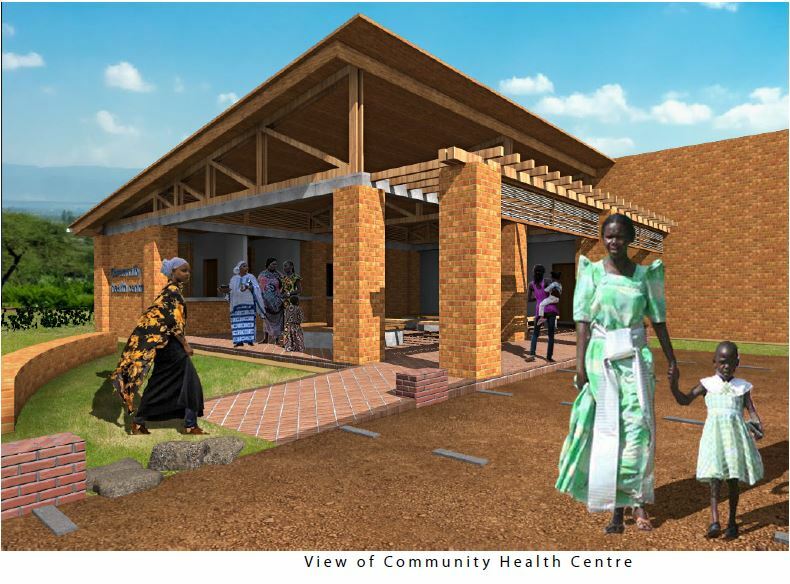 This is the reason we are so keen to house a medical centre at our Community Centre. 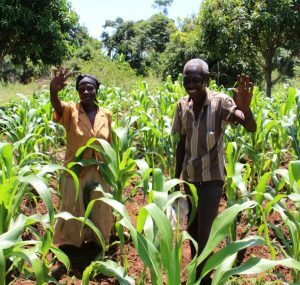 Ten Farmers agricultural development scheme bears fruit! 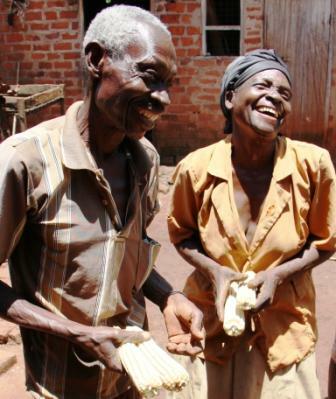 Frances and Ruth Kabale have been taking part in our agricultural development programme. They own a small holding and grow corn and received conservation farming training organised by BSUF. 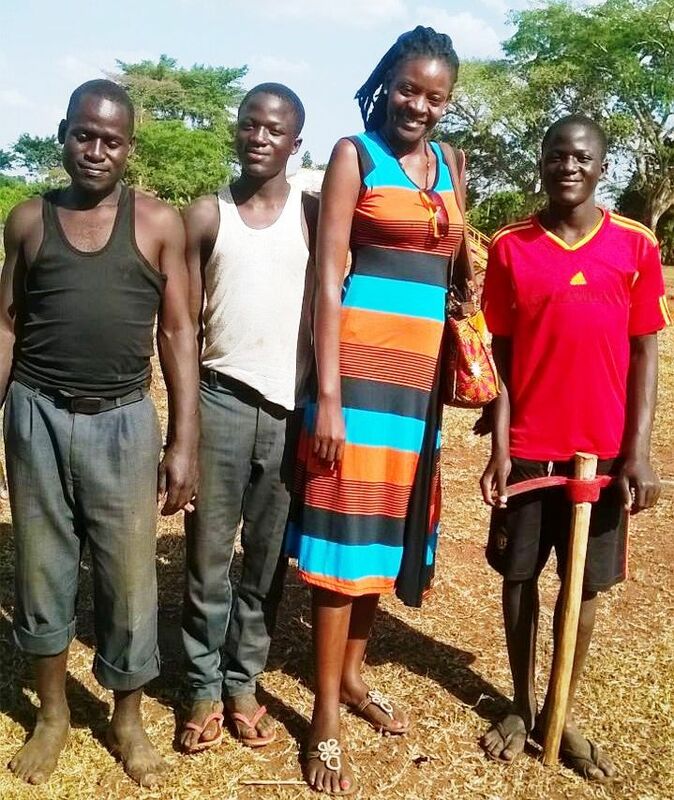 They were taught better practices and encouraged to use herbicides and organic manure. 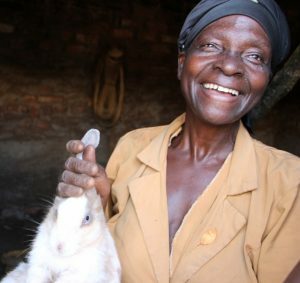 The result is that this year’s crop yield has been significantly bigger than usual, which has allowed them to buy solar power for their home and more pigs, rabbits and chickens. They are delighted with their success. Pre-school kiddies in the area used to meet at the local St Mary’s church and Annette recognised the need for a dedicated nursery school. 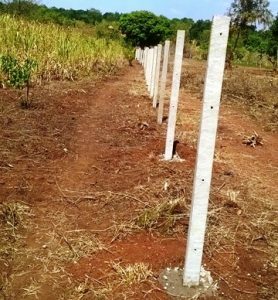 Part-funded by BEI International, the new Butansi Nursery has now opened. Butansi Nursery has raised the profile of Butansi village in the Sub-County and the community is very appreciative of BSUF work and presence. BSUF is looking at training the teachers’ in a suitable child curriculum that is based on play and learning through imagination in the children environment. 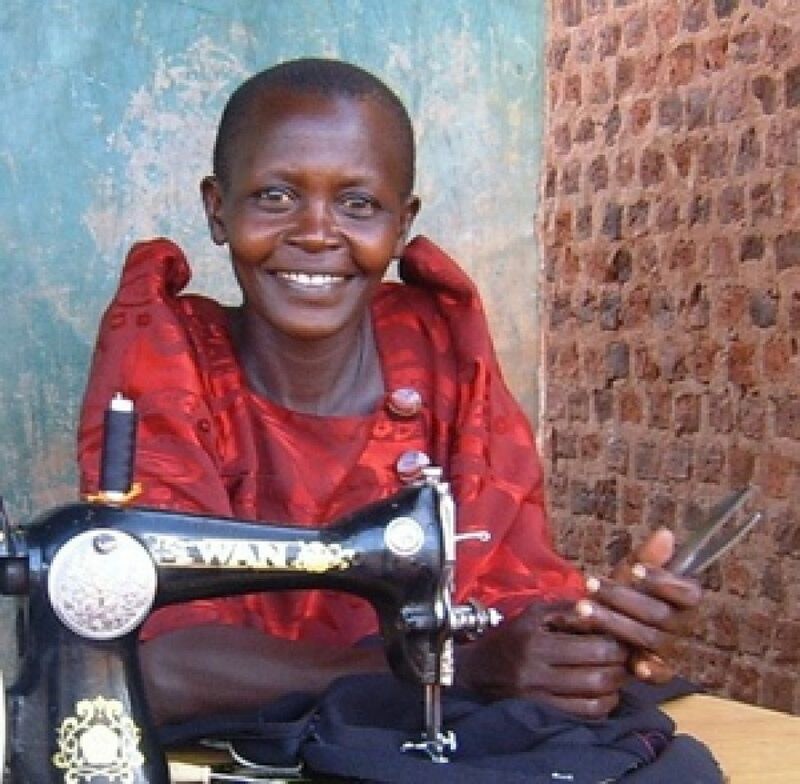 Monica Mukasa has a sewing machine in the Butansi Trading Centre. She used some of the money from her BSUF loan in June to buy rolls of material to make uniforms that she sold to local schools. She also used some of the money to pay for her son’s tuition fees. She then paid back her loan on time. Monica says; “Thank you so much BSUF. 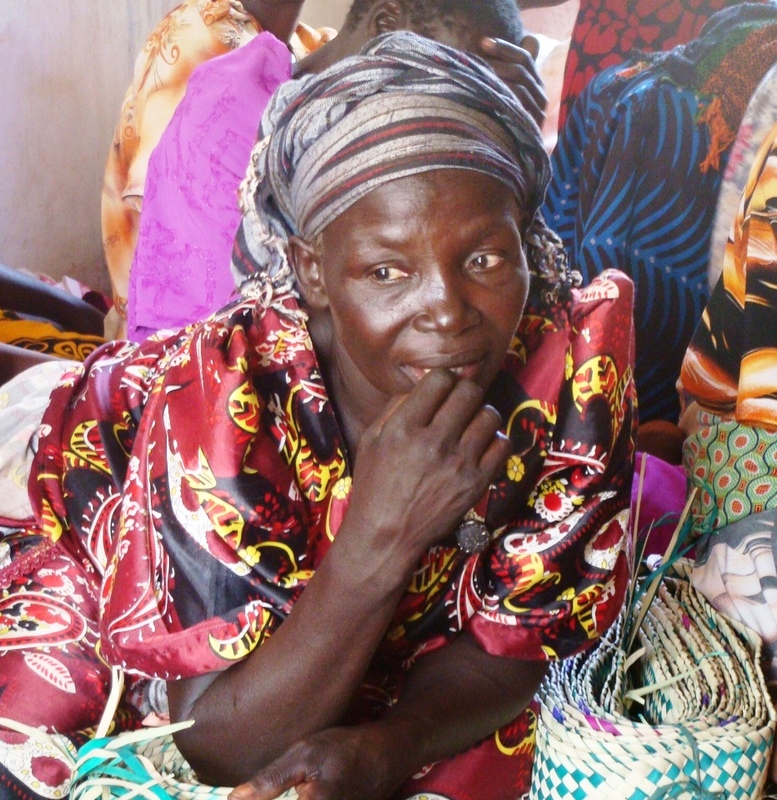 The loan made such a difference and I would kindly request another loan to continue to build my sewing business”. 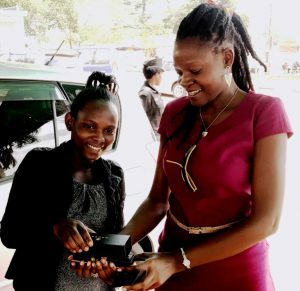 Betty Kitamirike receives money in July from Mrs Kitimbo, the Chairperson of the BSUF Self Help Women’s Group and Annette Mbedha (Founder of BSUF). Betty brought the money back in October, saying; “The money helped me pay tuition fees for my son who had been sent home for two weeks. Now he continues with his studies… thanks to BSUF”. BSUF founder, Annette Mbedha, attended the Barrington Education Initiative (BEI) International Global Networking in Education Conference in Amman, Jordan from the 18 – 21 November. 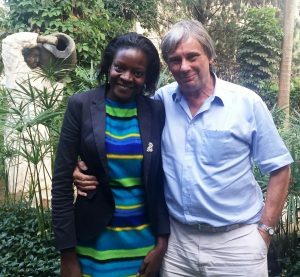 This was a terrific opportunity for Annette to meet and network with other NGOs from around the world that have benefited from BEI funding. Trustee Jon Exton and Dawn Perry attended the annual get together of the Christian Network Uganda group. The event was chaired by Rhona Marshall (Christian Relief Uganda), who set up the networking group, and hosted by Uganda Development Services at St John’s Church in Ealing This was a great opportunity to catch up with old friends and to welcome new charities that work in Uganda. 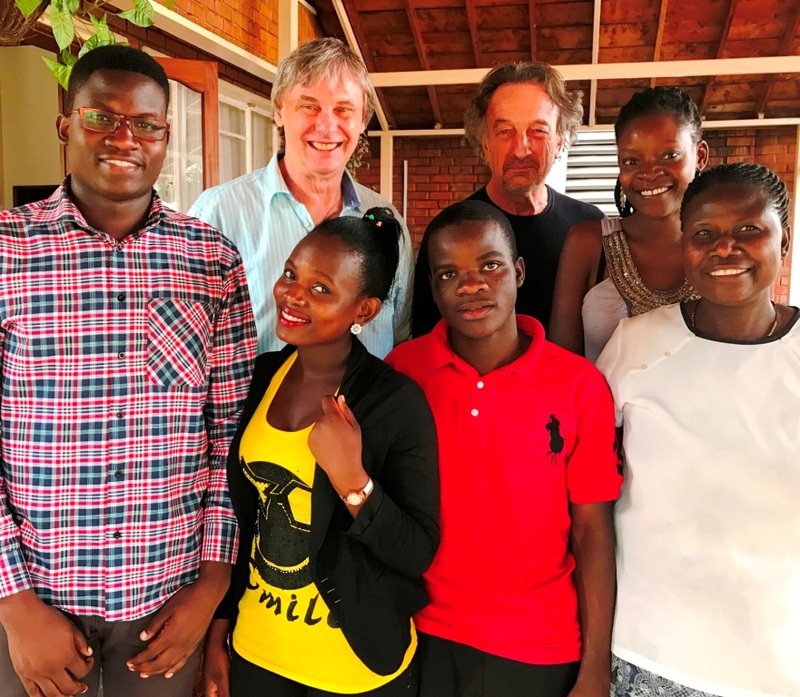 As ever, a very rewarding day – where experiences were shared and ideas swapped for going forward with our various projects in Uganda. 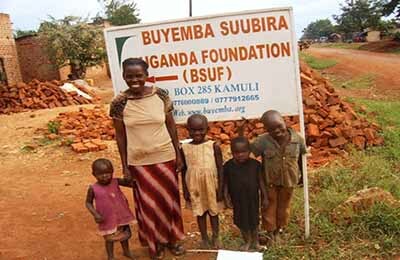 BSUF now has an office in Kamuli, which will give the charity a stronger local presence in the community. 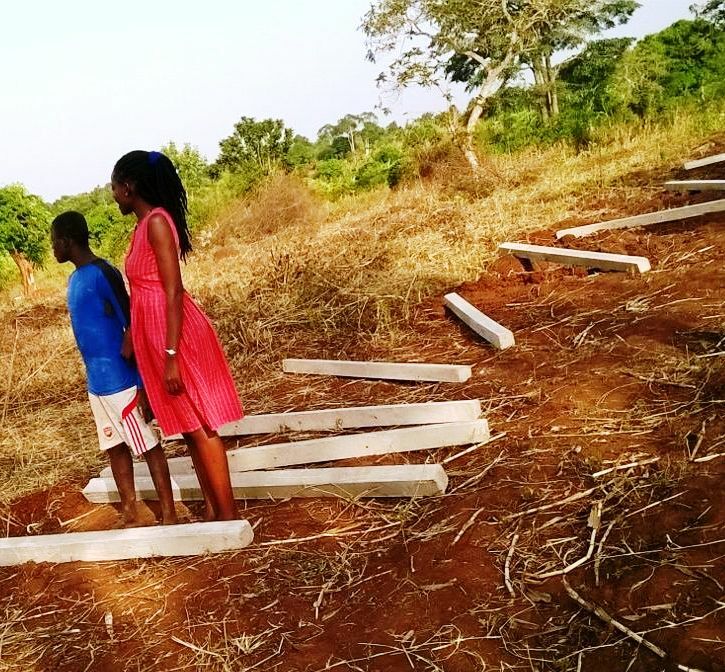 Headed up by founder, Annette Mbedha, the office is manned by local volunteers. Annette has been collecting clothes and toys from colleagues and friends in Kampala and these are now being distributed out to those in need in the local area. One of the volunteers, Rachael, is a former sponsored student of Children of Uganda (UK) – BSUF. BSUF and Annette to the rescue! Annette accompanied BSUF student Blair to hospital when he was bitten by a snake. He was then discovered to be suffering from severe malaria. 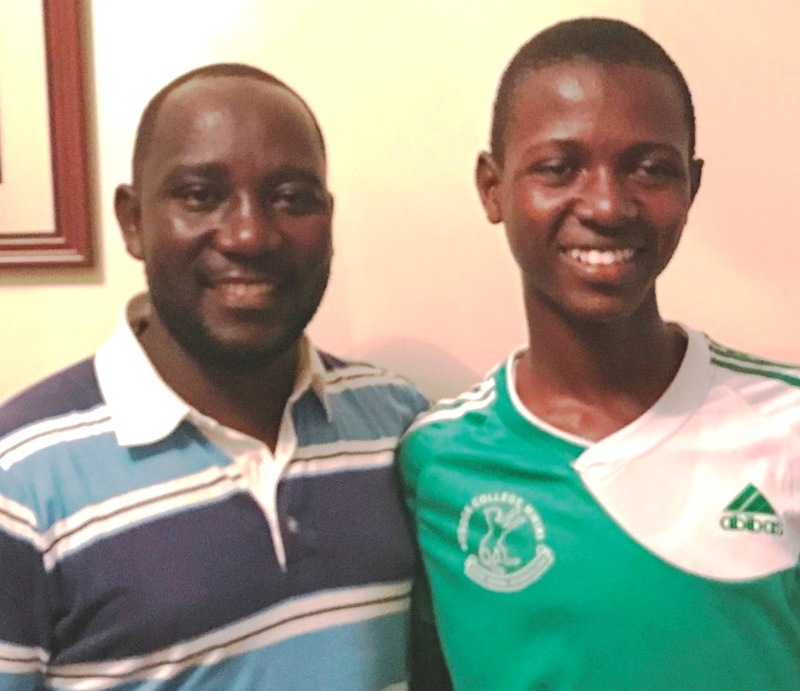 Thanks to prompt action, Blair is now fully recovered and back at school. We decided to support the Henry Van Straubenzee Memorial Fund’s building project at Butansi Primary School – which is adjacent to the site of our Community Centre project – by providing funds for 40 desks to the school. The desks have been greatly appreciated by both the teachers and pupils. 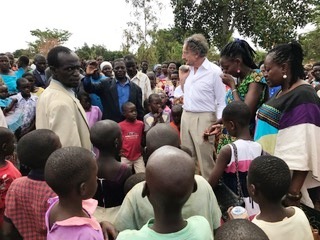 Classical pianist Panos Karan and his charity “Keys of Change” www.keysofchange.org visited Uganda – and Annette took Panos to Kamuli to meet and perform for some of our sponsored children. Although innately musical, the children where overwhelmed to experience this type of music and to be able to interact with Panos and hopefully get inspiration for the future. 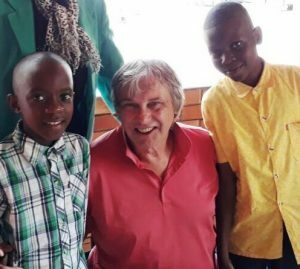 Panos is planning to shortly set up a Children’s Orchestra in Kampala. Panos is performing on Thursday 27th September at the Hellenic Centre London – a piano recital, plus stories and images from his earlier travels across the Amazon River, Sierra Leone and NE Japan. We are planning to hold another joint fundraising event, between “Keys of Change” and “Children of Uganda (UK) – BSUF”, which will focus on his experience of taking his music to Uganda. 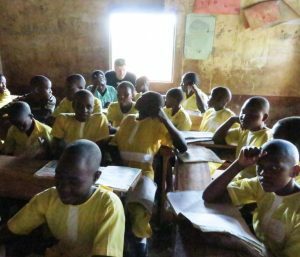 Visits to the schools where our sponsored children attend to meet with the headmasters and teachers as well as our sponsored children. One of our sponsored children was not at school and, upon investigation it was found out that he was housebound because he couldn’t walk! The Chairman immediately arranged for him to go to the local hospital to receive attention. 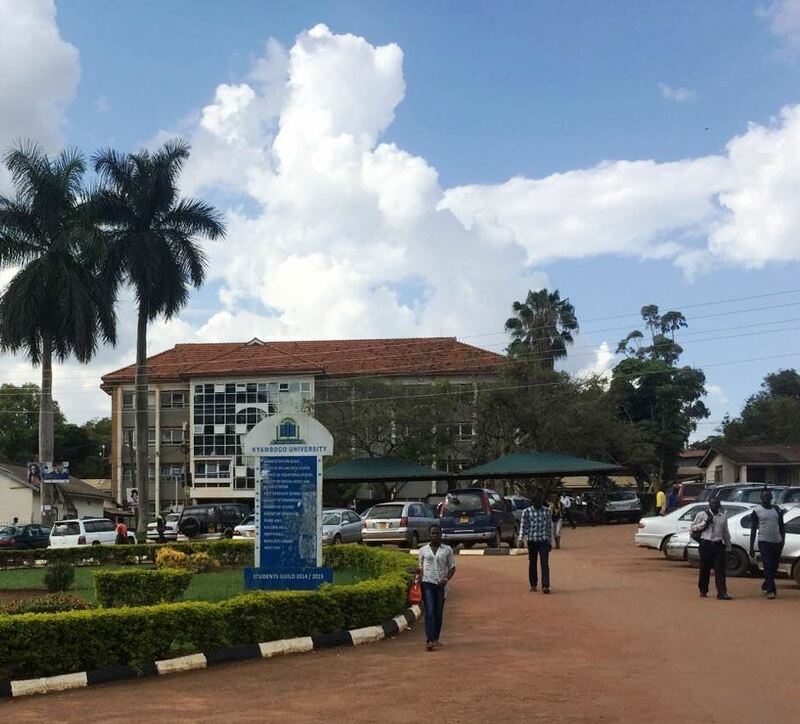 In fact, the young boy required an operation and the charity paid for him to be transported to Kampala for this and all his associated medical costs. The operation went well and we are delighted. He is now recovering and will soon be back at school. As you will see from our picture gallery, our schools do vary in building standards! 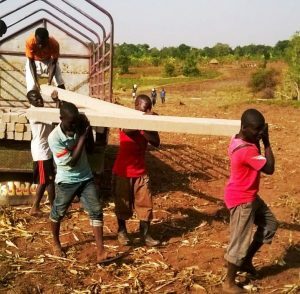 Children of Uganda (UK) – BSUF has now agreed to commit some funds to building new class rooms at two of our schools, as well as assist our neighbouring school, Butansi Primary, with one of its projects. Our Trustees were delighted during their visit to Future Victory School, in Butansi, to conduct the official opening of an Art Room funded by donations from Rushden Community College in Northampton. 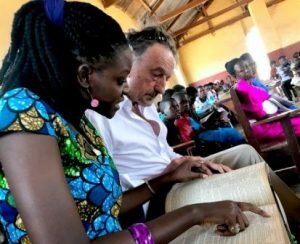 One of the highlights of the visit was to make a presentation of a leather bound St James Bible, kindly donated by Richmond Hill St Andrews URC in Bournemouth to the local St Mary’s Church in Butansi. The Bournemouth church had already donated monies to build much needed pews in the church. 300 people turned out, in their finery, for the special service and ceremony. Please view our video. Our Trustees had meetings with Kamuli Mission Hospital about the medical project now being planned for the Butansi area. We will shortly announce more details of Annette’s dream to provide basic healthcare in the community. We are about to survey and obtain land title for the land that has been donated by the Church in Butansi for the building of our Community Centre. 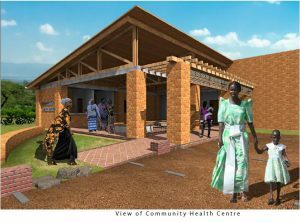 Then we will get started on a major fundraising exercise to build the Community Centre to benefit the whole community.